Messier 38 (also known as M38 or NGC 1912) is an open cluster in the Auriga constellation. It was discovered by Giovanni Batista Hodierna before 1654 and independently found by Le Gentil in 1749. 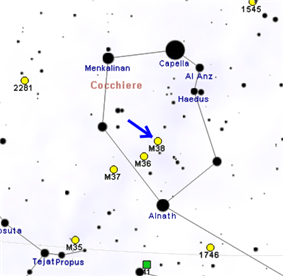 M36 and M37, also discovered by Hodierna, are grouped together with M38 at a distance of about 3,420 light years away from Earth. The cluster's brightest stars form a pattern resembling the Greek letter Pi or, according to Webb, an "oblique cross." At its distance of 4,200 light years, its angular diameter of about 20' corresponds to about 25 light years, similar to that of its more distant neighbor M37. It is of intermediate age (about 220 million years, according to Sky Catalog 2000) and features a yellow giant of apparent magnitude +7.9 and spectral type G0 as its brightest member. This corresponds to an absolute magnitude of -1.5, or a luminosity of 900 Suns. For comparison, the Sun would appear as a faint magnitude +15.3 star from the distance of M38. Photographs usually show a departure from circularity, a feature quite evident to visual observers. Older reports almost always mention a cross shape, which seems more pronounced with small instruments. A view with a 24-inch reflector on a fine Arizona night showed the cluster as irregular, and the host of stars made fruitless any effort to find a geometrical figure. ^ Majaess D. J.; Turner D.; Lane D. (2007). "In Search of Possible Associations between Planetary Nebulae and Open Clusters".